Spain in 1973. Sensitive Javier works as a clown. Like his father and grandfather he wants to make children laugh. Unfortunately his childhood wasn’t that joyful, so he becomes a “sad clown”. 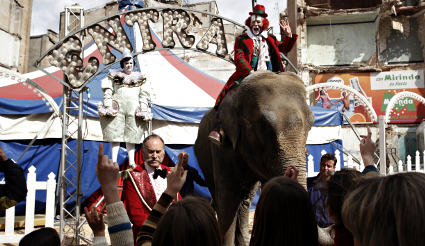 In circus he meets a ruthless “happy clown” Sergio, who terrorizes his collaborators and hits his girlfriend. Here begins a story about two clowns that will fight to death in order to gain love of a beautiful and cruel Natalie. Circus is an explosive mixture of extravagant cinema described by the director as a “grotesque tragedy” – crazy picture, that doesn’t accept any limitations. Adventures of both clowns take place in the background of Spanish history of the twentieth century, beginning with the Spanish Civil War up to the crazy seventies. Spanish film director. Belongs to the “unofficial” new generation of Hispanic filmmakers which includes Guillermo del Toro, Alejandro González Iñárritu, Alfonso Cuarón and Robert Rodriguez. At first he worked as a decorator for TV. His first and only short film as co-writer and director, Mirindas asesinas, won prizes at many festivals. His second film, The day of the Beast, won six Spanish Academy Awards. Dying of Laughter and the accumulator of Goya prices Common Wealth were a turning point in his meteoric career. From then on he became his own producer, and made such films like for example European Film Prize winner “Ferpect Crime”.